Burdock is one of those herbs that people are surprised has so much to offer. Known as a common weed here in America, in Asian cooking, burdock (Gobo root) is commonplace. Burdock is known as a medicinal food; meaning it nourishes the body and offers deep nutritive health to the body, notably the liver and urinary tract and skin. You can also use burdock for skin issues, both from within and applied directly to the surface of the skin. It is also a safe herb to ingest with some knowledge. As a root vegetable, it is a wonderful addition to the diet for all ages. As a poultice, it is also safe for anyone who is old enough to understand what is being done to them and can indicate if the application becomes too hot or uncomfortable. As a tincture or decoction, burdock works a little more strongly, and should be combined with a diuretic herb such as dandelion to move the toxins to the urine and not out through the skin. Burdock seed tincture should not be used by the home herbalist due to its strong efficiency. Burdock is a commonly found herb. It is often seen along waterways and usually in partial or shaded areas. Burdock grows best in alkaline soil, but this is not necessary for cultivation. Easily grown from seed, burdock is a biennial plant, that is directly sown in the garden, early in springtime. Stratification helps germination, but be aware that burdock has an incredibly high germination rate, so unless you have precious few seeds, stratification is not necessary. For the least amount of problems, it is best to grow burdock in an area where it can self-seed freely. This will ensure endless crops of seeds and roots for years to come. Since it grows so well in a shady area, if you have a large tree on the side of your landscape, oftentimes this is the perfect spot to plant your burdock crop. Burdock has long been considered a vegetable in Asian cooking. Known as Gobo, you may have seen the root in your local grocers and not even known that it was what we Americans consider a common weed. Burdock is a biennial, meaning that it grows for two years. The first year plants offer the roots. The seeds are harvested in the fall of the second year. They are contained in the familiar burrs that we all recognize and the ones our pets have unfortunately brought home tangled in their fur. The burdock root is harvested in the first year. 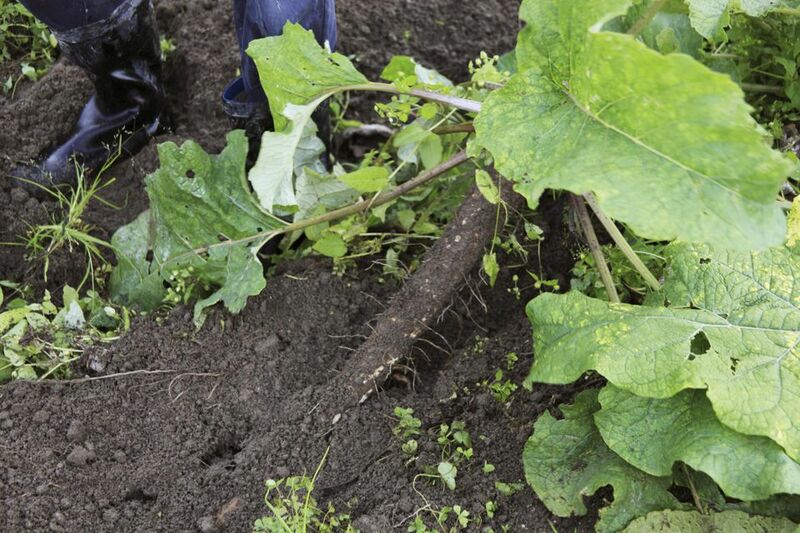 This is best done after moisture has been applied to the soil, as burdock has a very deep, large taproot. This taproot needs to be dug out with a spade or garden fork. Do not attempt to pull the root, it will usually break off part way down the root, and you will be left with a stub. It's aggravating and makes harvesting unpleasant. Both seeds and roots can be dried for storage. Wash the roots very well to remove all loose dirt or sand before drying. The roots also need to be chopped or sliced before drying, as they become rock hard once dry. Seeds should be removed from their prickly outer coating and then dried before storage. Look them over well for hidden insects. Do not use second-year burrs, as they will probably contain some insects. Fresh burdock leaves (either first or second year) can be lightly steamed and then applied as a poultice to draw out infection and speed healing. To store burdock, the fresh root is simply refrigerated or pickled for a nourishing food. The roots can be peeled and roasted with all fall vegetables, and the pickled gobo is delicious as a condiment. Combine gobo with potatoes and then mash everything together. The roots add an earthy taste that is pleasant. Burdock is also made into tinctures, infusions, salves and balms, and infused oils. Wildly useful, this herb is easy to grow and store.